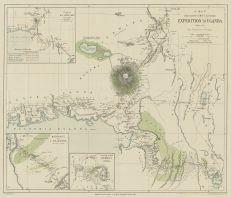 Sub-Title: A Map illustrative of M.r F. J. Jackson's EXPEDITION TO UGANDA, 1889-90. Notes: Associated with book ID 1090. Published for the Proceedings of the Royal Geographical Society, 1891. In the left margin, inside the neat line, there are three insets of the region.